The Copyright Transfer Short Form is used to transfer the copyright ownership of a project from one party to another. This agreement is more project based and can be used for transferring ownership of the copyright after a project is complete. By default, the developer normally retains ownership of the copyrights of material created for a client unless the developer is an employee or ownership is given specifically to the client in the contract. In many cases, the clients may assume (often incorrectly) that they own the material. You should at least retain ownership of the copyrights until after the client has paid all invoices in full and such terms are normally part of the initial contract. If the client backs out for whatever reason and/or payments are not made, the developers should normally retain ownership of the material. This can be useful for artists, graphic designers, writers, programmers, developers, photographers, media creators, singers, film and video producers and anyone else who creates intellectual property. This Copyright Transfer Short Form Contract is included in editable Word format that can be customized in Word or by using the included Wizard software. For valuable consideration received, I ("undersigned") hereby grant to Company Name ("Company") the rights and transfer of all interest and claim to: description of material hereinafter referred to as ("the Material"). Copyright to the above listed work is hereby transferred to Company Name, effective as of the date of this agreement, including, and without limitation, the right to publish the work in whole or in part in any and all forms and media, now or hereafter known. All proprietary rights other than copyright and the publication rights transferred to Company Name. The right to publish in a collection, journal or future works of the author's own (such as articles, letters or books) all or part of this work, provided that acknowledgement is given to Company Name and a full citation to its publication in the particular proceedings is included. The right to make oral and speech presentation of the material in any forum or venue. The right to make copies of the work for internal distribution within the undersigned's organization and for external distribution as a preprint, reprint, technical report, or related class of document. 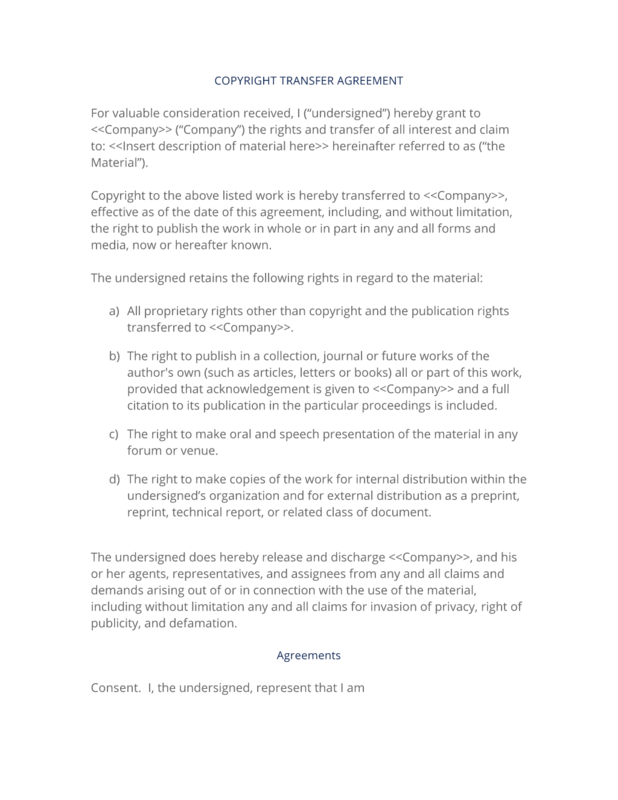 The undersigned does hereby release and discharge Company Name, and his or her agents, representatives, and assignees from any and all claims and demands arising out of or in connection with the use of the material, including without limitation any and all claims for invasion of privacy, right of publicity, and defamation. I, the undersigned, represent that I am over the age of eighteen (18) years and that I have read the foregoing and fully understand its contents. This release shall be binding upon me, my heirs, legal representatives, and assigns. This Agreement shall be binding upon and inure to the benefit of Company Name and their respective successors and assigns, provided that Company Name may not assign any of their obligations under this Agreement without the undersigned's prior written consent. Job title of signator, authorized signature or signer. The complete Copyright Transfer Short Form Contract - with the actual formatting and layout - is available in this Contract Pack.